Preliminary designs for the planned $90 million Kona Judiciary Complex on Hawaii’s Big Island were revealed this week. The Hawaii State Judiciary held an open house at the West Hawaii Civic Center to release the preliminary renderings and design plans for the 10-acre, 143,000-square-foot courthouse, which is being designed by Honolulu-based Architects Hawaii Ltd., and is expected to start construction in March 2016, with a completion date targeted for 2019. The complex, which will be located close to Kailua-Kona, mauka of Queen Kaahumanu Highway, and across Makala Boulevard from the Makalapua Center, is being designed to be water, energy and environmentally efficient and sustainable, in addition to its significant security and electronic equipment provisions. 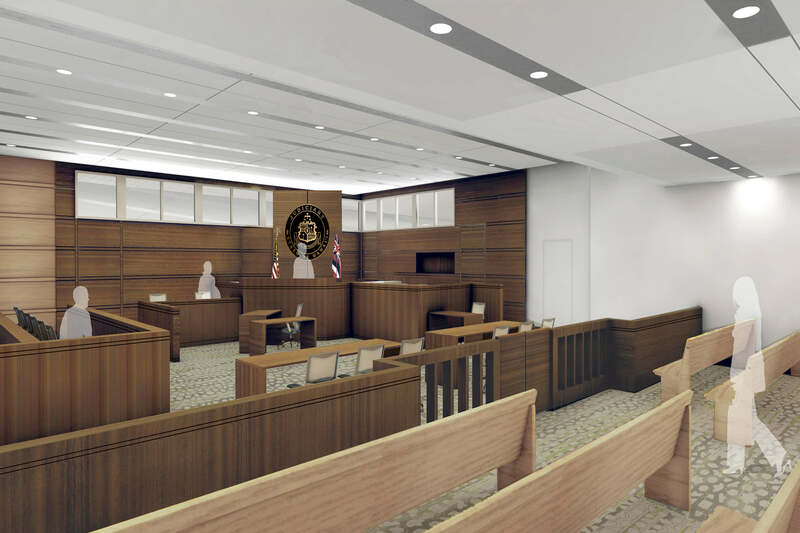 It will have at least five courtrooms with space on-site to add more courtrooms and offices in the future, as well as conference rooms, a law library, a self-help center and nearly 300 parking stalls. The state Legislature has committed $35 million thus far to fund the Kona Judiciary Complex, and the state Judiciary will be seeking the remaining $55 million needed during the 2015 legislative session.